My new book is available today. My friend Dennis Walters and I have been working on it for a while and we hope you enjoy it. You can see and order it here. You can buy it now as a Christmas bundle with free shipping and other of my new items. Topics include: How popes are elected, the great popes, are popes above criticism, the pope and Islam, list of all the popes, why is a pope necessary and much more. 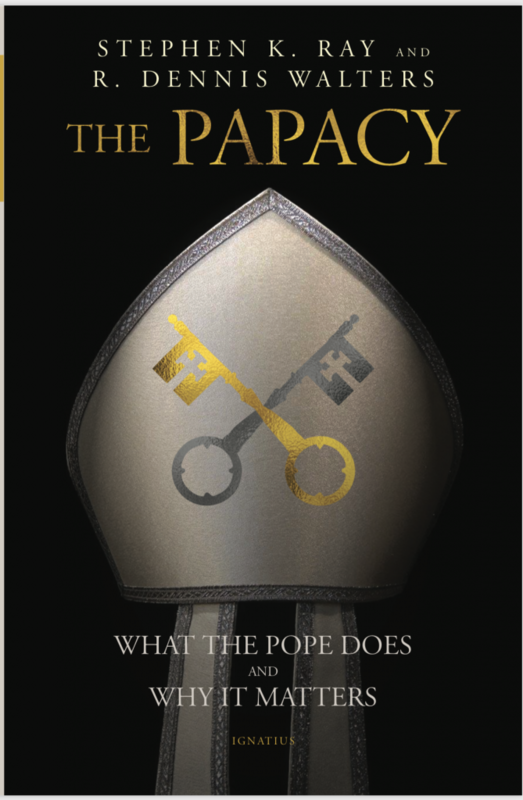 This is not a book about Pope Francis or any particular pope. 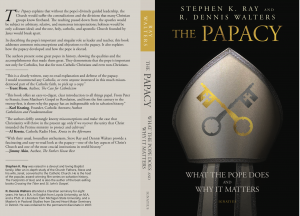 It is more like a “job description” of what the papacy is and what the job of the pope is. One can evaluate any pope based on how he lives up to the “job description” that Jesus provided and that the Church has held for 2,000 years. 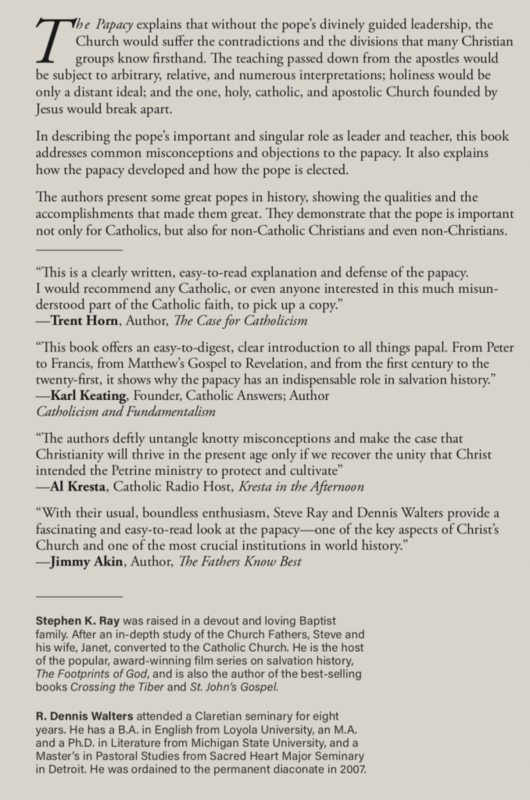 CWR: When you were a Baptist and looking at the Catholic Church from the outside, what did you think about the papacy? Stephen K. Ray: A year before I was born my parents became Baptists; they prayed for kids and I was born a year later. My father was taught to be very anti-Catholic. He loved books and I still have many of his old books from the 1950s in my library. I recall one even from my days of tussling with my brothers on the living room carpet. It loomed large on the shelf. It was entitled The Two Babylons and Papal Worship was in the subtitle [The Papal Worship Proved to Be the Worship of Nimrod and His Wife]. That particular book is still on my office shelves today. My father’s passionate Baptist views of Bible and Christianity had a huge impact on my early years, as I loved my father dearly. If he said the Pope was the anti-christ and that Catholics worshipped the Pope instead of Christ, who was I to argue with him? After all, I didn’t know any better and I didn’t know any Catholics. As I grew older and experienced more of the wide world and other Christian groups, I continued to view Catholicism as a “man-made institution” invented by clever men who twisted Scripture to manipulate gullible people who had never read the Bible for themselves. I wondered: Why would freedom-loving people in America want to let some old man in Rome tell them what to believe and what to do? Hadn’t we overthrown kings and emperors? Why subject ourselves again to a foreign leader named “the Pope”, who intended to encroach in every area of our lives? We had the Bible and the “Bible alone” and that was enough for us. CWR: What were some key arguments or facts that changed your views? And how do they inform this particular book? 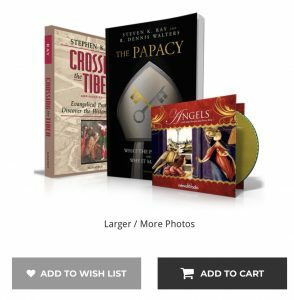 Ray: Having no interest in the Catholic Church, other than to convert naive Catholics to real, biblical Christianity, several things converged on us at the same time. For the rest of the interview, click here. Trail of Blood: Do Baptists Have a Claim to the Original Church? What is the history of Baptists? Can they trace their roots back to the 1st century? Many ”fundamentalist” Baptists believe they can. Are they correct? There is a booklet that is very popular among this fundamentalist crowd. It is entitled “The Trail of Blood”. 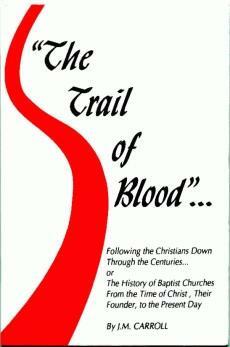 The booklet claims that Catholics persecuted the true Christians — the Baptists — leaving behind a trail of blood. 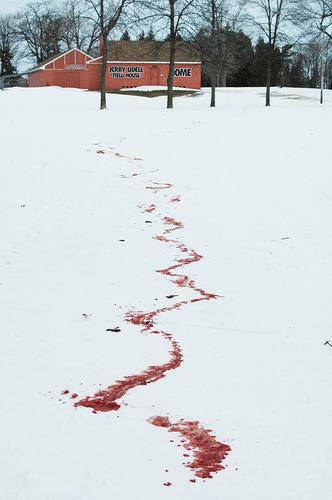 -For my full article on the Trail of Blood, click here (pdf). -For other articles and references, click here. -For more such articles and letters, click here. Have Kids? Know Kids? Do They Know about the Corporal and Spiritual Works of Mercy? Jesse Ray here. We just finished producing my dad’s newest recorded talk on CD. Proclaiming the Gospel: Back Then – And All Over Again. It is available now for a special price along with his popular book called Faith for Beginners – Understanding the Creeds. Sample 1 | Sample 2 Click HERE to learn more.